Even without directly replacing what creatives do, artificial intelligence is bound to have a considerable impact on human creativity. AI can be used in the creative realm in a variety of ways, ranging from computational AI-based art to supporting human creativity or to imitating existing styles and artworks. As AI becomes more dominant in automated visual production, creative professionals will have to rely increasingly on the intrinsically human aspects of their creativity. AI, machine learning and neural networks have begun to enter the creative realm in a variety of ways, all of which are bound to have a significant impact not only on what kind of visual output is created, but also how it is perceived, and what role it plays in society. Computational AI-based art: While the field of computational art has been around for decades, the use of AI and associated technologies is relatively new, and used by a growing number of artists, such as Pierre Huyghe and Mario Klingeman. They generate visual output entirely based on neural networks, machine learning and other computational processes to create intriguing and often stunning work. There is no doubt that this field is likely to grow significantly over the next decade. On the other hand, it is not yet clear if it will interfere with traditional methods of producing art, or rather (as is likely) extend artistic practice into new dimensions. Imitational AI-based art: Efforts to produce output that mimics (with varying degree of success) existing styles of conventionally produced art are also developing rapidly. Sometimes technically very impressive, (such as the AI-based “Rembrandt” that went on sale at Christies) this kind of visual reverse-engineering is in fact closer to sophisticated reproduction than to human creativity—yet highlights questions that can be disturbing about the essence of a work of art. Democratization of sophisticated visuals: AI and machine learning have the potential of making the creation of very sophisticated visuals available to casual users. 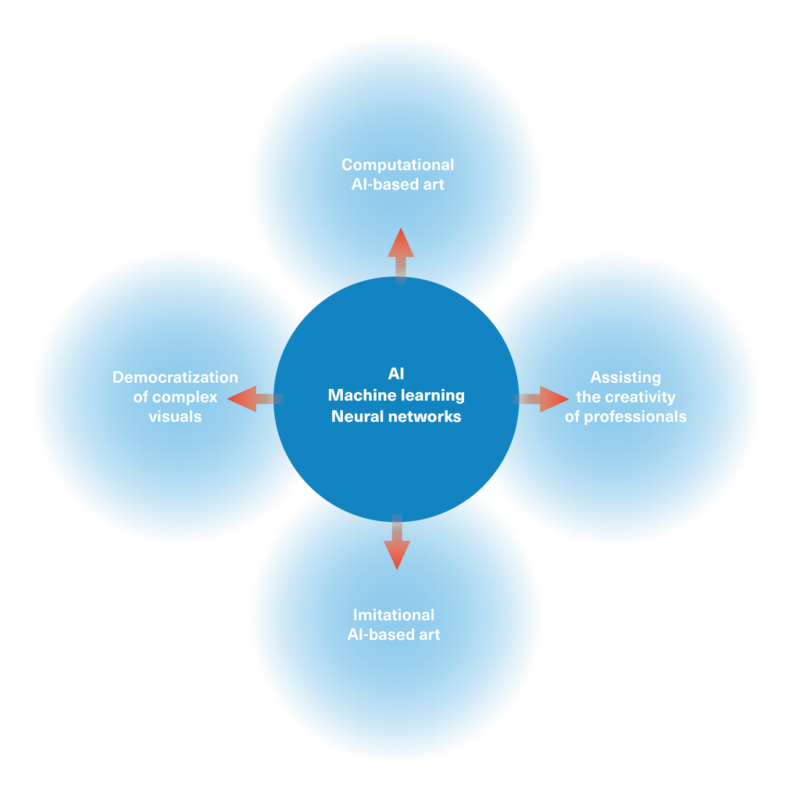 By applying techniques such as style transfer and other machine-learning-trained methods to generate visuals that would have been very time-consuming to produce even for a skilled professional, AI and machine learning are lowering the barrier of entry to an extent that may lead to the devaluation of skills and expertise of creatives. It is likely that these developments will increase significantly in the future, and will have a distinct impact on the way creatives express and manifest their unique creative talents. 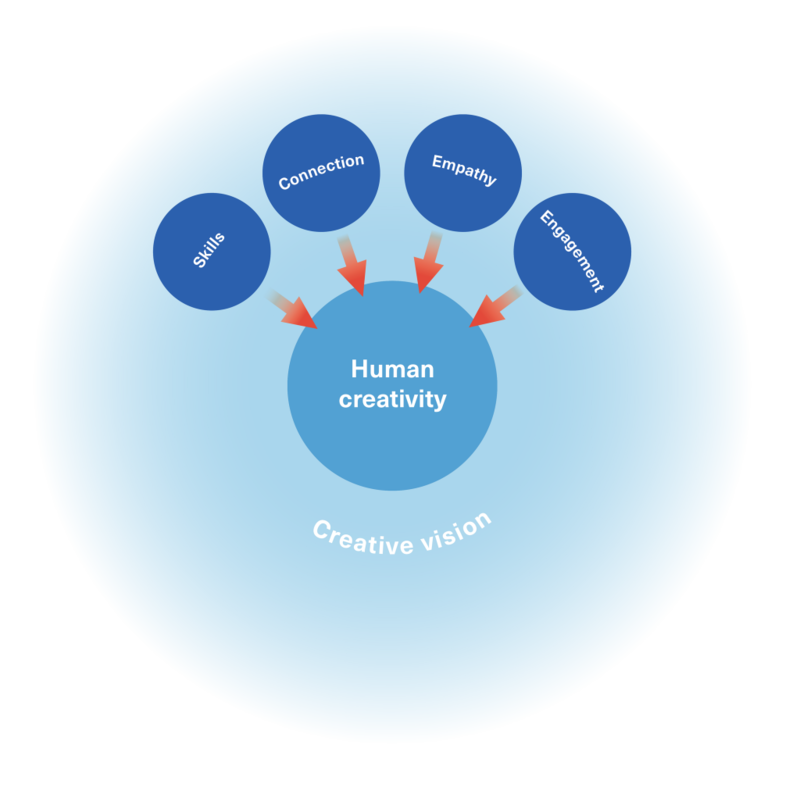 Assisting the creativity of professionals: Finally, AI and machine learning can be used to liberate creatives of drudgery, complex execution and organizational tasks, to allow them to focus more of their time on their creativity. While of the four examples listed here, this last set of developments is the least immediately spectacular, it will nevertheless have a strong impact on the kind of creative work that is produced. To assess the impact of these different fields of AI-based developments on the creative realm in general, and on creative professionals in particular, we should first look at them individually, before attempting to analyze possible areas of ripple effects and cross-pollination.. Already in its current state, computational AI-based art is a fascinating field that is likely to inspire a wide range of emerging artists. Yet, as of today, there is a high entry barrier in order to produce works like the ones cited above, and such work requires a very specific mind-set and disposition, as well as considerable technical knowledge. In that sense it can not yet be considered a readily available tool for artistic expression — but it is only a question of time before “consumer-level” programs and technologies allowing to mine machine learning and neural networks make their way into the mainstream, and start shaping what artists and creatives produce. The situation of imitational AI-based art is more complex. At the highest level it requires not only access to the original artworks, but also teams of specialists, cutting-edge technology and many months of collective effort. Given these constraints, it will take many years before these developments become accessible even for companies or institutions with considerable funding — let alone creative individuals. Yet ML-driven functionalities that allow specific style elements to be transferred from an existing image to another are starting to appear on-line. Similar functionality is likely to show up in apps like Photoshop quite soon, as Adobe’s “Project Puppetron” demo at Adobe MAX 2017 suggested. Depending on how this feature will be implemented, it could have wide-ranging ripple effects in the creative community. Making style transfer available as a push-button option could have a considerable impact on how creatives format multiple elements requiring a consistent style, thus speeding up their workflow — yet in the process running the risk of reducing the kind of creative accident that is often seen as a positive force in the creative process. On the down-side, depending on the power and implementation of such a feature, it could also facilitate plagiarism, a concern that has been voiced repeatedly during the research interviews. But on the other hand, a style transfer feature could also allow improvised creative experimentation that would be impossible without the help of AI and machine learning. As one designer put it: “Creativity does not necessarily mean using a tool for its intended purpose.” Subverting tools and letting creativity run rampant in ways unintended by the developers is likely to lead to results we would have a hard time imagining now. The threat some see in the impact of AI and machine learning on human creativity is not new. The history of computer-based visual creation is shaped by the democratization of tools, making the production of sophisticated designs ever easier and more accessible. Starting with the first wave of page layout and vector design tools over three decades ago, this evolution has had an extremely liberating effect — but in its wake, countless professions have been challenged, and in some cases utterly devastated. But democratization is not the only issue here. Increasingly, we can witness two kinds of creative tools: those aimed at the creative professional — and those targeting completely inexperienced users. This last group also includes apps that are not openly labeled as “creative”: Instagram and Snapchat have become creative platforms for millions of users who live happily with the limitations of the apps, and still manage to express their personal creativity. Similar considerations can apply to the increasingly powerful cameras in recent smartphones, that offer automated processing options for very sophisticated results, which previously would have required professional equipment and years of experience before. Yet we are only at the beginning of AI-driven creative functionalities. And as they expand, it is clear that they will amplify a trend that has been reported by numerous creative professionals during the research: Everybody feels like a designer now, and thinks what can be achieved with simplistic tools is to be considered at the same level as the fully structured creative project of a professional. We are facing some far-reaching implications here: Traditionally, creative professionals are being considered and valued on the strength of the visual aspects of their work — yet it is becoming increasingly clear that what really counts for the appreciation of their work goes well beyond cool looking visuals. But what that implies, in the long run, is that creatives need to find different signifiers for their capacities — and also on-line resources allowing them to show off their talents in other aspects than visual execution. But there is another implication to this trend, which directly concerns software developers: The more AI and machine learning start to dominate the way visuals output is produced, the more important it will be for the developers of tools to understand — and to individually address — the needs of both the casual creative and the creative professional independently. The changes in the requirements of creative professionals to get their job done in the most efficient way need to be understood and addressed. Currently, for creatives, the most important developments based on AI and machine learning are linked to alleviating drudgery and repetitive operations that later stages of most creative projects necessitate. The present research also underscores an expectancy that the multitude of individual steps in the production process should be more intelligently managed by machine intelligence in the future. There is a problem, though: while in their overall structure, the processes involved are clearly defined, they way each individual creative handles them can be very different. In larger operations, workflow systems that handle these tasks more efficiently have been in place for many years; for the creative individual, however, these systems are often perceived as too constraining. In order to solve this problem, AI and machine learning can step in — not primarily in order to come up with a universal workflow solution, but rather in understanding how the creative mind deals with these issues. This may turn out to be much more complex than it appears at first blush, as creatives need freedom and flexibility in order to build their own personal workflow — every creative organizes these tasks in his own individual way. Of course none of the trends outlined above exist in a vacuum. Assuming that as AI progresses, human creativity remains at a stand-still would be a absurd. As machine intelligence becomes increasingly powerful in producing outcomes that in the past required human skills and expertise, how will uniquely human creativity evolve? That they, unlike the machine, can fully focus on the WHY of a project, while the machine can only produce the WHAT.